The University offers Master of Philosophy (MPhil), and 3-year and 4-year Doctor of Philosophy (PhD) programmes. A successful MPhil thesis should represent the result of the candidate’s research which displays some originality and which demonstrates a sound understanding of the field of study and the appropriate research methods, and a successful PhD thesis should represent the result of the candidate’s research which should be an original contribution to knowledge and worthy of publication. Candidates will conduct research work under the supervision of at least one member of the University's teaching staff. Candidates without a research Master's degree will be considered for admission to a 4-year PhD programme, and those who hold research Master’s degrees will only be considered for admission to a 3-year PhD programme. Candidates for the research degrees of MPhil and 4-year PhD will be required to follow an approved course of study and research including coursework. The objective of the coursework component is to aid research work and preparation for writing the thesis. MPhil and 4-year PhD candidates will be required to take courses as specified in the coursework syllabuses, including two compulsory core courses offered by the Graduate School. 3-year PhD candidates who register on September 1, 2011 and thereafter will be required to take one compulsory module on research ethics. Please refer to the section “Coursework Requirement” for details. (c) a University Research Assistantship, provided that the work undertaken in this capacity is focused on the topic of the holder’s research degree study. The status of the candidature must be affirmed in the form of a written declaration by the head of department, the supervisor(s) and the student. A full-time candidate may hold a University postgraduate scholarship or another postgraduate scholarship or studentship which is intended to enable him or her to study on a full-time basis. Candidates pursuing MPhil or PhD studies are first required to register provisionally for the degree, and their registration is subject to a probationary period specified below. At the end of this probationary period and after submission of a detailed scheme of research, the candidature will be confirmed or terminated. * Students can submit theses before the end of the normative study period but not earlier than the minimum study period which is half of the normative study period. MPhil students may apply for transfer to PhD after confirmation of candidature and after completion of coursework requirements, provided that such transfer is approved at least 3 months prior to the expiry of the MPhil candidature. PhD students may apply for transfer to MPhil within the first 12 months (3-year PhD) or 18 months (4-year PhD) of candidature, in the case of full-time students, or within the first 18 months (3-year PhD) or 27 months (4-year PhD), in the case of part-time students. The results of the research must be presented in the form of a thesis, which will be examined by both internal and external examiners. In addition, candidates are required to take an oral examination. Other examinations may be prescribed if they are deemed necessary. Candidates may be accepted for research studies leading to the degree of MPhil or PhD by a teaching department of the University or by an academic centre/institute/school/unit. The principal areas of study can be viewed here. Note: Due to the withdrawal of funding from the University Grants Committee for part-time students, part-time research degree programmes are offered on a self-funded basis at the fee specified above. The annual Composition Fees are normally payable in two instalments. Candidates are required to pay the Composition Fees upon acceptance of offer and thereafter during the period of study, and the Continuation Fees quarterly thereafter if they are permitted or required to study beyond this period. 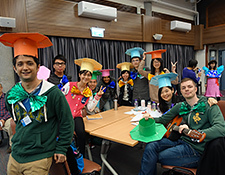 The joint programmes offer full-time students the opportunities to benefit from shared research excellence in a wide range of disciplines between HKU and its prestigious partners. Students will acquire enriching international experience in learning and research, an invaluable asset in their career development. The programmes are elite and will admit only a very small number of high calibre students. Students have to apply directly to the programmes. Transfer from a conventional single PhD programme to any of the joint programmes listed below will not be accepted. Students can apply for study leave of up to half of the entire period of study, for the purpose of studying at the partner university.